I first became a fan of author Anthony Doerr when I read his short story collection The Shell Collector some nine or ten years ago while working on my master's degree. His prose was beautiful and each story seemed to carry great emotional significance. Last year I read his Pulitzer Prize-winning novel All the Light We Cannot See and like so many others, I found the story of a young, blind French girl and her relationship with her grandfather living in occupied Paris during WWII to be truly moving. The story ran alongside a dual narrative of an orphaned boy growing up in Germany during the same era and the crossing of their paths makes for a great story. If you haven't read it yet, do so! In Four Seasons in Rome, Doerr presents a memoir of just that: a year of his life in Italy. Doerr learns he has received the American Academy of Arts and Letters' Rome Prize, a prestigious grant that supplies a stipend and year-long writing studio in Rome. One can only imagine the dream such an opportunity would be for a full-time writer, but irony sets in as readers learn Doerr received the much sought-after award the day after he and his wife left the hospital with their newborn twins. I greatly admire Anthony and Shauna's sense of adventure as they boarded the transatlantic plane with their babies and dove headfirst into living abroad, diapers, babies, language-barriers and all. My favorite aspect of the memoir is its complicated honesty: Rome is beautiful--Doerr openly admits his sense of wonder, gratitude, and awe walking its streets--but their lives are messy. Caring for their newborns is exhausting, the couple struggles with conversing in Italian and the frustrations that can arise from trying to accomplish the simplest of tasks such as grocery shopping, and while Anthony tries to write, he finds himself suffering from writer's block and incurable insomnia. It's the conflation between these two worlds that makes the book so enjoyable because it's so relatable--it's the the dynamic of the human condition. At times, Doerr's life seems to be crumbling around him and at others he's caught breathless by the history and culture that surrounds him. My heart broke for him when his wife collapses and Anthony finds himself trying to juggle caring for his babies and literally running the city streets to get Shauna admitted to the hospital. Anthony travels the country, contemplates the ancient ruins of temples, and participates in the massive crowds keeping vigil for the dying Pope John Paul II. 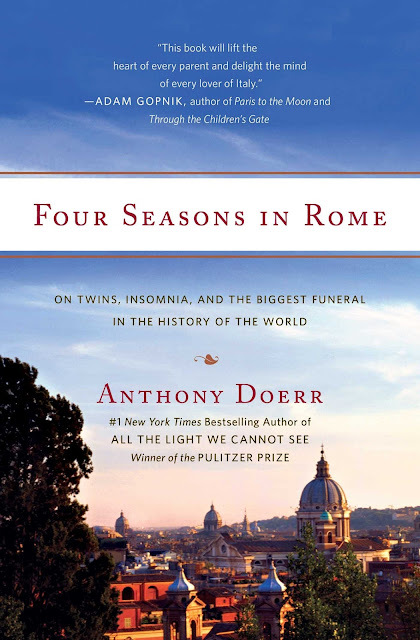 Upon his death, millions of people flood Rome's streets and Doerr's description of the mourning, sense of community, and profound depth of his emotional investment for his wife, his children, and the art of writing culminates in a beautifully rendered story of how our seemingly everyday lives are fascinatingly extraordinary.